Our mission at Heart Path Journeys is to provide you with the tools and skills to make peace with the past, rejoice in the present and create a fulfilling future full of love, vitality, balance and abundance. We offer retreats on Maui in the beautiful state of Hawaii! Our private retreats are offered whenever you are able to come to Maui. 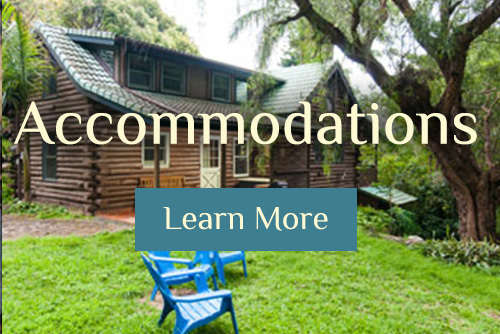 Our retreats are private and personalized just for you and your needs. When you join us for a Hawaiian Retreat and step onto this sacred land rich with culture, the beauty and serenity that surrounds you will immediately begin to soothe your soul. 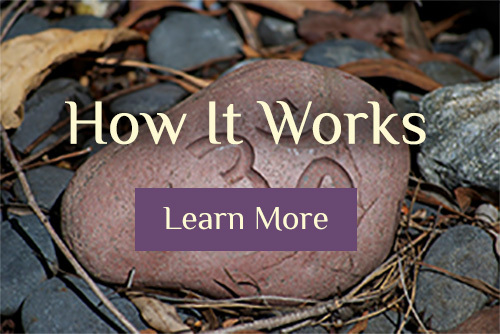 Request to have a consultation with Eve Hogan, owner of Heart Path Journeys and relationship specialist and allow her guide you to the perfect retreat—for you, your relationship, family or group. Relationships impact every aspect of our lives—whether we are trying to get into one, get out of one, heal from one or improve one. Heart Path Journeys will teach you how to access another part of your being to help you heal the past, live in the present and create the future you want. Our relationship retreats are private and personalized to meet your needs, budget, interests and timeline. Whether you are single, a couple, married, divorced, or healing from relationship loss, your time with us will empower you to stop the drama of the ego-dance and create REAL-ationships. The Heart Path leads to greater love, joy, happiness and intimacy. Here are our Sessions related to Love and Self-Mastery. Whether you are seeking a pre-wedding, wedding, or honeymoon retreat to start your marriage off right, fully equipped with the tools you need to help your relationship thrive or are already married and seeking to grow more deeply together. Rejuvenate or rescue your relationship or even recover from one, our custom relationship retreats will perfectly suit your needs. Finding the right partner is only the first step. Gain the skills to keep your love and joy alive. Heart Path Journeys has an amazing array of relationship tools, skills, and experiences to assist you in creating healthy, sustainable, loving relationships. Here are some of our sessions on LOVE… and Self-Mastery education. Even just ONE DAY To a Healthier Relationship can make a HUGE difference! We can officiate weddings and vow renewals on Maui as well with simple, sacred ceremonies at the beginning, middle or end of your Maui retreat! Let us know your needs and we will be happy to customize your experience! Recreation allows RE-CREATION of a family or group bond. Rejuvenate your family, reconnect, and rebuild your bond. Go beyond just taking a vacation! Make this an experience that will transform your lives together when you return home. • Take a vacation with meaning and growth! • Improve your family dynamics. • Identify family values and goals. • GROW as a FAMILY while having FUN on Maui! Eve Hogan specializes in working with teenagers and young adults as well as do some of our other talented practitioners! Heart Path Journeys will customize a retreat based on the perfect balance of fun and adventure and learning and growth. Our Adventures in Awareness sessions and Sacred Sites Tours allow you to learn while you explore. From Maui labyrinth tours to hiking adventures to exploration of self, relationships and the meaning of your lives, our retreats will serve you individually and collectively. Practitioner led activities like Scuba Diving or Ziplines are also available, helping you to make every activity on Maui a transformative opportunity. Ultimately, every retreat is a spiritual and personal growth retreat, no matter what you call it. As Jung said, there is no problem that doesn’t have a spiritual solution. However, we do have sessions that are more intentionally focused on a spiritual and personal growth focus. Most of us operate “asleep” for the majority of our lives, with moments of awareness, clarity, creativity, intuition and wisdom. Heart Path Journey’s Spiritual Growth Sessions will guide you to turn that around so that you spend the majority of your life awake, aware, powerful and in gratitude, with perhaps a moment or two here and there of unconscious reactions. My favorite quote is “The breeze of Grace is always blowing, but we must set our sails to catch it.” Our spiritually focused retreats are not religious (we honor the truths and paths of all religions) but rather focused on guiding you to align your words, thoughts, actions and beliefs with your values and your goals so that you can live a life of self-mastery, integrity and alignment. • Clear the obstacles (ego, hurt, fear, anger, the past, limiting beliefs) so that you can access your wisdom, intuition, creativity, clarity, happiness and love. Our sessions devoted to Spiritual growth are personalized, private and powerful. You will leave with a richer, deeper connection with Spirit and know, beyond a shadow of a doubt that you are in good hands! Wellness and healing comes in many forms—emotional, spiritual, physical and mental. We believe that movement, relaxation and learning while steeped in beauty and serenity are critical to our well-being as humans. • Get your Yoga on! Stretch, balance, and become centered! • Have fun! Whatever your current fitness, we will help you get moving, whether you are ready to simply go for a walk on the beach or hike up a mountain. Whether you are needing time and tools for healing, want a “time-out”from your daily routine to rest and rejuvenate, or you seek to jump start a healthier life-style of weight-management, fitness, strengthening and movement, our expert practitioners can guide you. From Yoga to QiGong, hiking to beach walks, cleanses and colonics, weight management, energy and vitality enhancement, acupuncture, Reiki, and crystal bowl healing—we have a myriad opportunities for your wellness. We even have a cancer support coach to assist you in navigating the journey through cancer and beyond. Heart Path Journeys will customize the perfect retreat based on your interests. Grow your mind while loving your body! We can guide you on your heart path, back into your own center where peace and joy reside. Labyrinths are popping up all over the world as a powerful path of self-discovery, peace, prayer and contemplation. Maui is no exception, there are at least eight labyrinths in entirely different settings ranging from ocean side to tucked beneath a Kukui tree forest beside a stream. 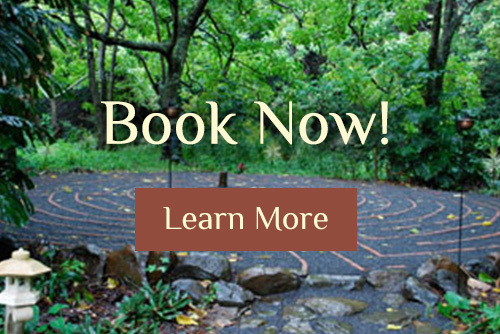 Journey through Maui’s labyrinths with a certified labyrinth facilitator and experience the differences between them. this promises to be powerful experience. We weave labyrinth work into most of our retreats…however, it is possible to have a retreat dedicated to working on the labyrinth, learning about them while you learn about yourself, and training on how to use them in your own work. When you stay at a hotel or a resort, the streams are not real, and most of the rocks on the grounds are made of cement. While they do a beautiful job of fabricating nature, real nature holds a healing vibration that cannot be duplicated. Add to that a spiritually charged place from years of worship, prayer or respect and you have a place that can open your heart, stir your soul and facilitate lasting change. • Experience REAL Maui and ancient places of reverence. Maui offers wonderful hiking experiences whether along the coast, through an ancient lava flow or into the crater of a dormant volcano. Our practitioners guide you on a hike with the focus of spiritual awakening, and a deepening of your awareness. You can do these adventures solo or have a Practitioner accompany you to assist in raising your awareness, overcoming fear, and guiding you to see Maui through Spiritual Eyes. The Adventures in Awareness Retreats often include the Pele Ceremony. After suffering a loss of a loved one, a relationship, a job, a career or after any major transition, taking a time out to regroup, reconnect and rejuvenate is a powerful choice. The root of “Emergency” is “Emergence” and in the midst of every challenge is a huge opportunity for growth. • Enhance your self-esteem, clarity, strength and resilience. • Resonate with your heart while using your head. Your relationship with yourself is the primary foundation for your relationships with everyone else and impacts your motivation and productivity. This retreat will focus on deepening self-understanding and self-mastery. The Sessions most sought in these retreats have to do with emotional healing. Our “Feel to Heal” retreat is ideal for managing life’s rapid and difficult changes. Our One Day to Transformation is a great option also! Art, writing and creativity are FUN, AND they are also full of self-discovery. While few think of creativity as a necessity for problem solving or relationships, it is an important skill as one realizes there are more than one “right answer” and ways to do things. • Express your emotions and visions colorfully! Whether you want to write a book, journal or draw/create for fun, learn about photography, explore the deeper recesses of your being or create a master piece, Heart Path Journeys can either create the perfect guided art and creativity retreat for you or give you the quiet, sacred space you need for your own creativity to flow. Creativity Sessions can be added to any retreat. Maui is the home of numerous gardens and farms dedicated to beauty, tranquility, sustainability and alternative farming methods. Hydroponics, aquaponics, spiritual gardens, lavender farms, tropical flowers…Discover what plants have to teach you. Maui is also the home of some extreme environments from ancient lava flows, rain forests, marine sanctuaries and a 10,000 foot volcano and is a world-class destination for tourist activities. We will happily guide you through seeing all that Maui has to offer through spiritual eyes and/or guide/accompany you as you set out to fully experience Maui. We can help you over come fear of leaping off a zipline platform, take you scuba diving in Maui’s pristine waters, do a Pele (Hawaiian Creation Goddess) Ceremony atop Haleakala, or take you on an adventure in awareness in a tropical forest. Whether adventure is the focal point of your journey or merely woven into your healing or spiritual retreat, we will customize your magnificent experience. Work for a non-profit while you are on vacation! Tithe your time, talent, skills and attention to a worthy cause! Whether you likes plants, animals, people or the land…or all of the above, there are plenty of opportunities to do a service retreat…and you can add a little pampering in while you are at it and get a massage! The Divine Nature Alliance is a non-profit dedicated to rejuvenation, education, inspiration and peace. All of this in a beautiful, healing garden sanctuary—The Sacred Garden. Volunteer your time in the garden and discover that you are the one who grows! Inquire now for more information on a service retreat! We have excellent photography teachers and professional photographers to guide you on the ins and outs of using a camera to MAKE pictures rather than TAKE pictures. Discover or enhance your ability to express yourself while capturing magical moments and places of beauty. Whether your interest is underwater or above, video or still pictures, we have an excellent crew who has shot for NatGeo WILD, Discovery, The Travel Channel and numerous magazines. We can also turn you into a Mermaid and do a photo shoot of you! Inquire Now for more information on the numerous possibilities!